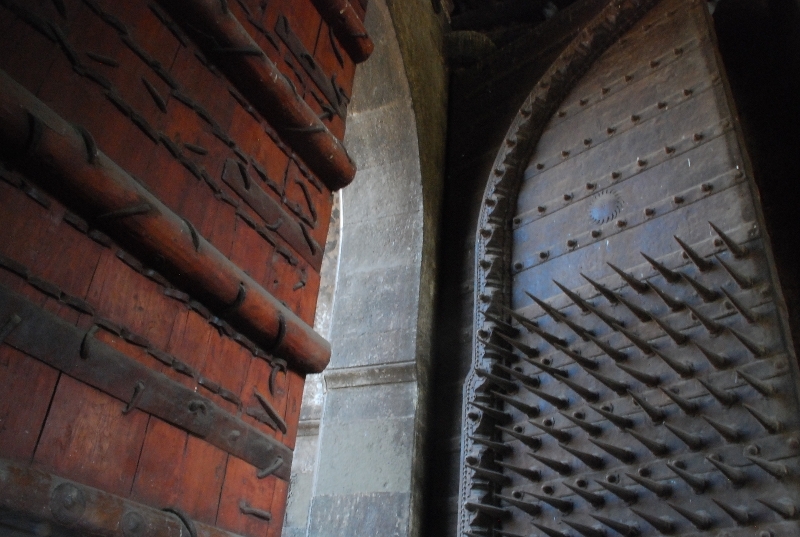 I don’t know how long I’d been standing there in front of the massive ‘Dilli Darwaza’ of Shaniwar Wada in Pune, enamored by the several rows of steel spikes protruding out from mid-section of those giant doors. Named so because the entrance faces north towards Delhi, Dilli Darwaza and its spikes were easily the most noteworthy items I saw in the fort. The spikes, as I learned later, were to prevent enemy elephants from charging the doors. As I wrapped my fist around one of the spikes, I conjured up images of the fort in its glory days – ornately clad elephants and powerful soldiers with heavy weapons doing routine marches sprang to life in my mind’s eye. The mental imagery left me in an intoxicated state (yeah, I don’t need much to get a high these days. Maybe it is old age setting in). As I walked into the fort, I wondered why I never found history so appealing during my school days. 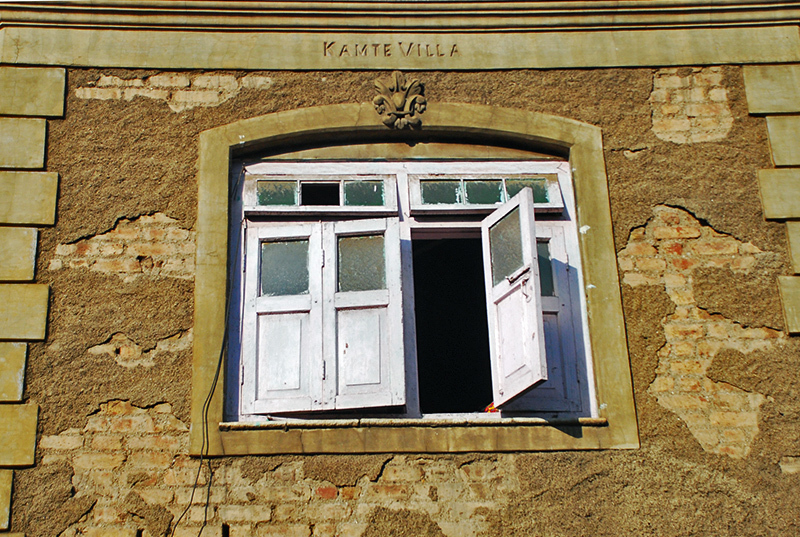 I was on a ‘Pune Heritage Walk’ – a guided walk through eighteen historic sites of old Pune. I had recently moved to Pune, and was finding it difficult to get adjusted to this vast city. Having lived in a small, coastal town down south (Mangalore) for more than a decade, I had got used to the small commutes from home to office, low traffic and relatively less polluted environments. The suburb in Pune, where I had taken an apartment, was in total contrast to this. I found the pollution (due to ongoing, fast paced construction all around), traffic and vastness too overwhelming for me. Having to live away from my family and friends added to my woes. 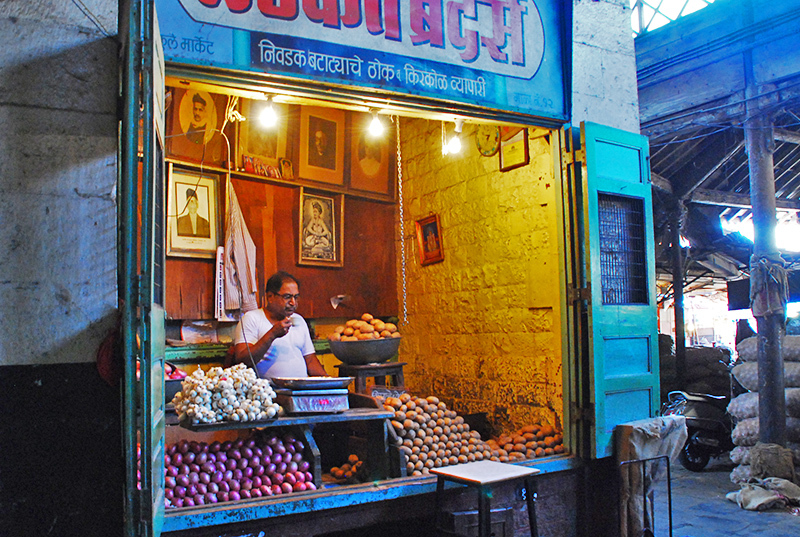 Two things helped me maintain my sanity: food, and my weekend explorations on foot through various parts of Pune. When it comes to food, I can eat anything (well, anything except bitter gourds). Food is usually my therapy for lifting spirits – my BMI is testimony to that. 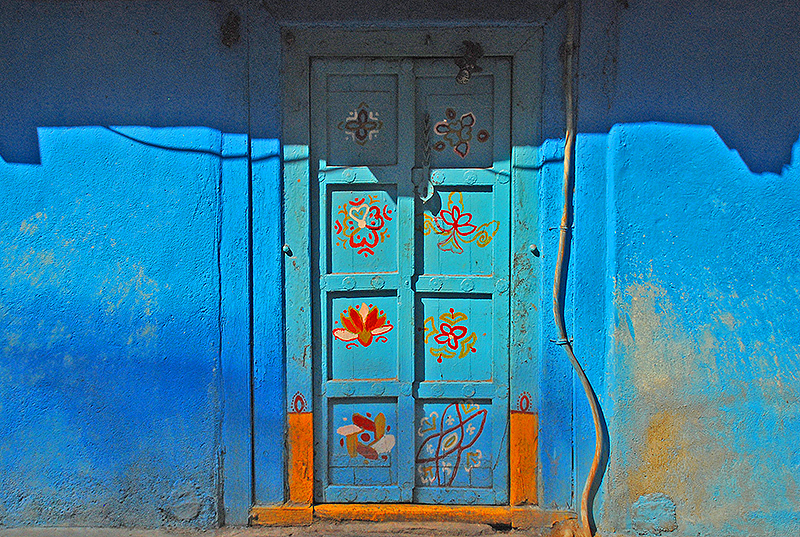 On weekends, I walked around different parts of Pune, clicking pictures with my very loyal ten year old Nikon. 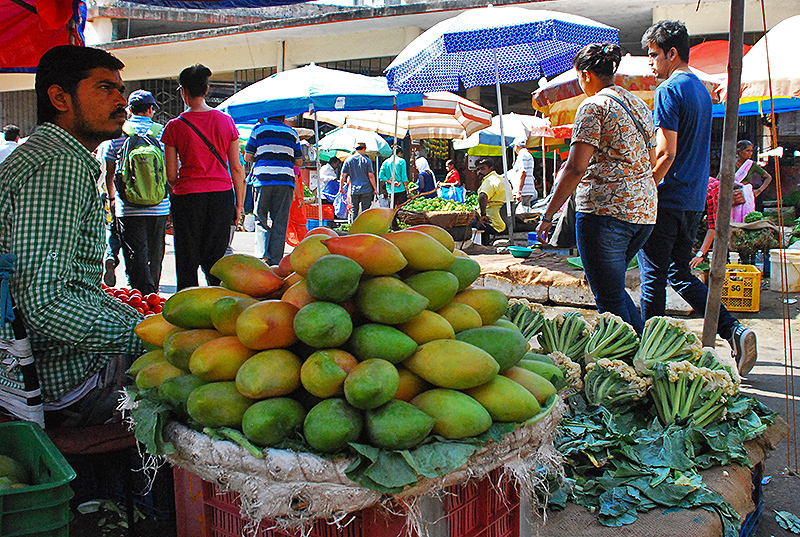 A street vendor selling mangoes. Managed to shoot it while drooling. 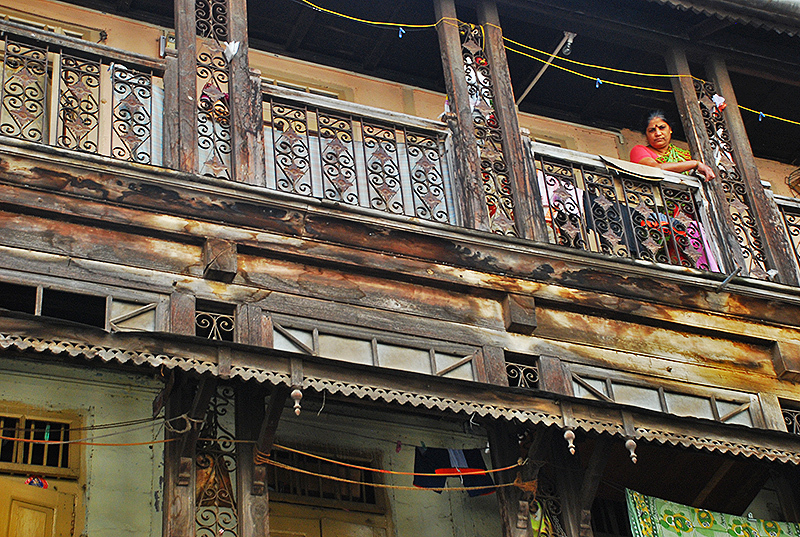 One such exploration had led me to the Peths of Pune, and I instantly fell in love with old Pune. 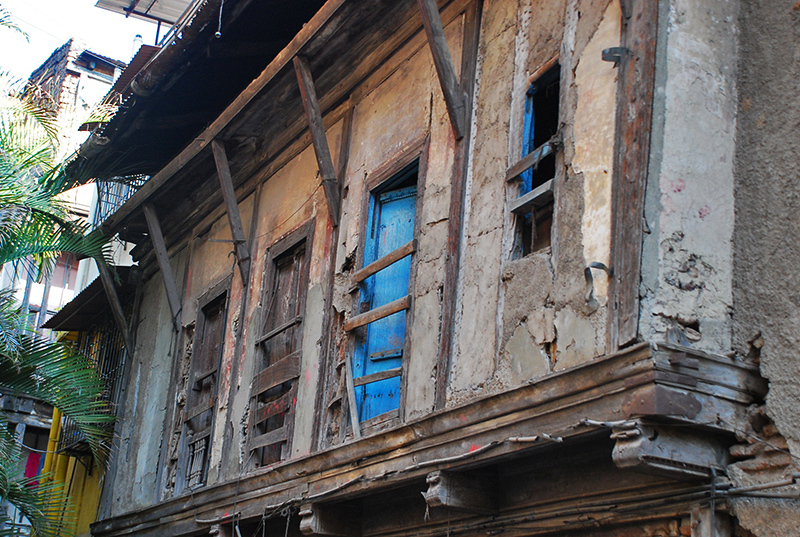 The dilapidated but still functional Wadas, heavily crowded streets, shops selling all sorts of colourful merchandise, strong scents of incense and street food wafting through the air – all provide for a heady sensory experience. 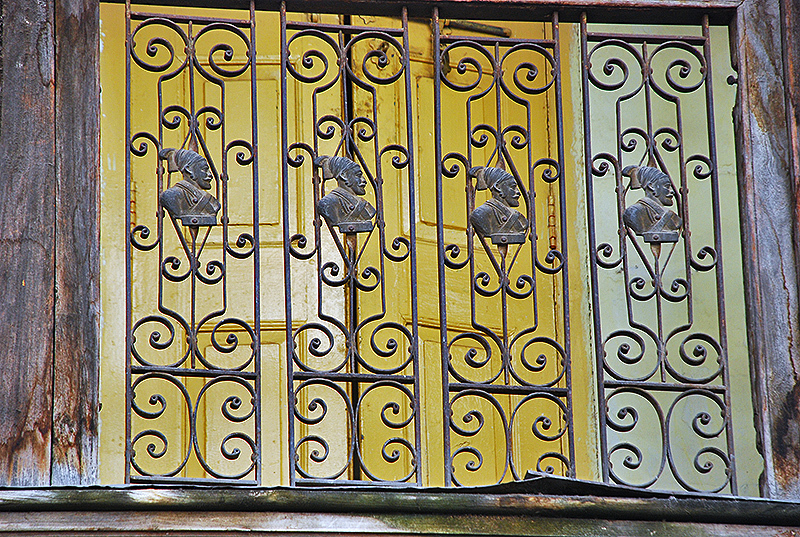 If Pune were a living being, these old parts of Pune would be its heart – for this is where life throbs with raw energy in Pune. Well, in short, I was fascinated with all the history that lay frozen in time in ‘old’ Pune, and I was hungry to learn more; Pune heritage walk promised me just that and I signed up for one. The insides of a Wada. This one looks like it could come down anytime. Needless to say, I didn’t stay long here. She was wondering what the fuss was all about. I have always been a fan of windows. Thus. Held on Weekends (Saturday and Sunday at 7:00 am), Pune Heritage walk is organized by Pune Municipal Corporation and Janwani, an NGO. The organizers had asked me to be present in front of the Pune Municipal Corporation building by 7 am. I reached there 20 minutes ahead of time, and since I had some time to kill, I set off in search of some morning tea. I found a bakery nearby, had a glass of very sweet, tasty ginger flavoured tea and returned. By then, a decent-sized group of fellow participants had assembled in front of the building. Among the participants were a family of four, a few young couples and a German lady. Some of them were conversing intently with our very knowledgeable guide. He handed us each a brochure containing details about the sites we were about to visit. We started off our walk with an overview of the PMC building from our guide; after which he shepherded us onto Shivaji bridge. Much like the Kapoors, this bridge is known by two to three different names – Lloyd’s bridge and Nava Pul being the other names. The bridge, constructed over 90 years ago, had open terraces and lamp posts since the British had built it as a spot for spending evenings. The bridge was built using a mix of European and Arabic architecture styles. My next house will have an entrance like this. In Pune, you can find Chhatrapati Shivaji everywhere! We then came upon the famous Shaniwar Wada fort, made even more popular recently by the Bollywood flick Bajirao Mastani. Our guide told us some interesting tidbits about the fort, one of them being about the choice of the site – it was chosen after the Peshwas noticed a rabbit chasing a dog there (symbolizing their struggle against the powerful British army). Frankly for me, the fort itself was a big letdown. Once you enter the fort through the Dilli Darwaza, there isn’t much to see, really. 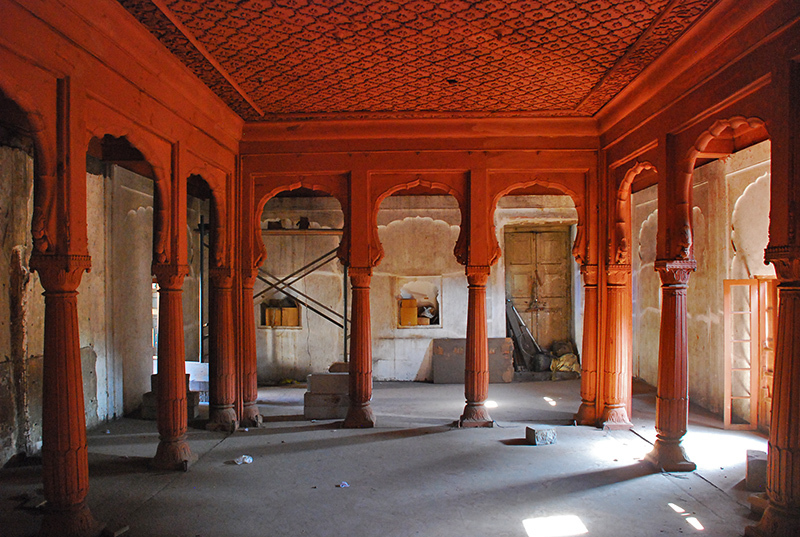 What was originally built as a seven-storeyed headquarters of the Peshwas had since been reduced to a rubble by an unexplained fire. Today, what you will find inside is a garden and hordes of tourists taking selfies. But our guide’s stories about the fort and my mind’s vivid imagination that brought those stories to life made the visit a memorable experience for me. The Jharoka above Dilli Darwaza. 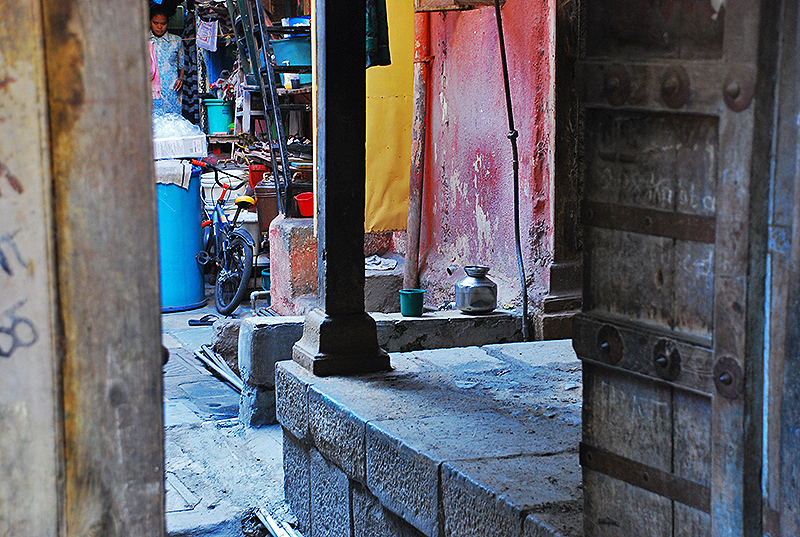 Our walk took us through Kasba Peth, where skilled artisans and traders used to live. We were told not to use our cameras in Kasba Ganapathi temple since it was on the target list of terrorists. In front of the temple was a 104 year old lady selling offerings for the God. I spotted quite a few artists around Kasba Peth, making sketches of various buildings in the area. 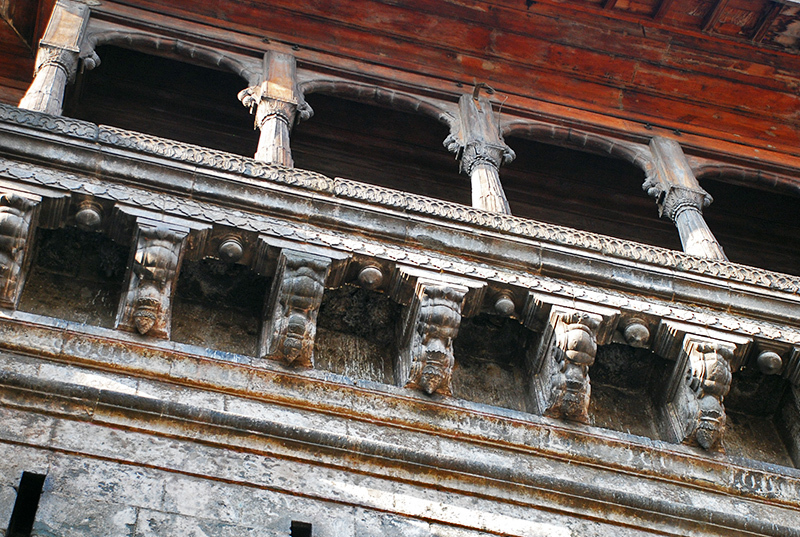 Nana Wada, built by the wise and influential minister of the Maratha Empire – Nana Fadnavis, was our next destination. Since it was being redone, we could see a lot of cardboard boxes, tools and debris in the building. The insides of Nana Wada. One of the couples in our group seemed to have prepared well for this tour, since they kept asking questions to our guide. Our guide, happy with the kind of interest his tour was getting, gladly poured out stories to them, partly in Marathi. The couple clearly had become the guide’s favourites. I felt like I was in school again with peer pressure building up inside me, almost forcing me to ask some questions to keep up with the over-enthusiastic couple. However I quickly quashed the urge by putting on a ‘strong silent man’ look and nodding my head whenever our guide looked towards me. Our next stop, Bhaurangari Ganpati temple, turned out to be very interesting. The temple is housed in a two-storey home of a gentleman named Bhau Lakshman Javale, a physician who ran a charitable dispensary. He came to be more famously known as ‘Bhau Rangari’ since his family vocation was dyeing ethnic Maharashtrian sarees. Bhau Rangari also aided revolutionaries of the freedom struggle, helping them store their weapons so that they could move around without the British being suspicious of them. The house has secret tunnels, and the front door has a secret latch (that still works), which the revolutionaries could use to enter the house even when it is locked from inside. This was quite a hit with our group, and we role-played what fleeing revolutionaries would’ve done – clicking open the latch to enter the house, and vanishing inside. The Lord Ganapati idol here does not have the usual peaceful demeanor; instead the depiction shows a violent Ganapati killing a monster – said to symbolize the freedom fighters’ aspiration to overthrow the British rule. 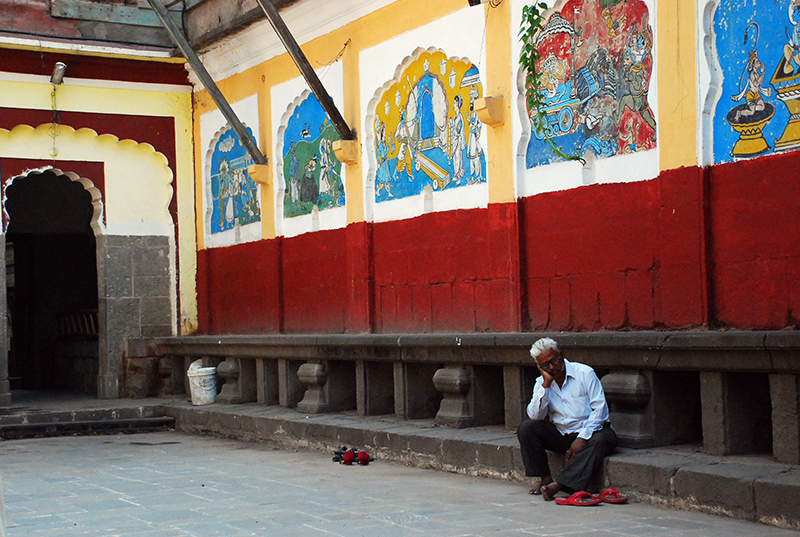 This is also where the first public Ganesh festival was held in Pune. Originally organized as a common place where the revolutionaries could meet and pass on information about the Freedom struggle, the celebrations have since become bigger and more popular. 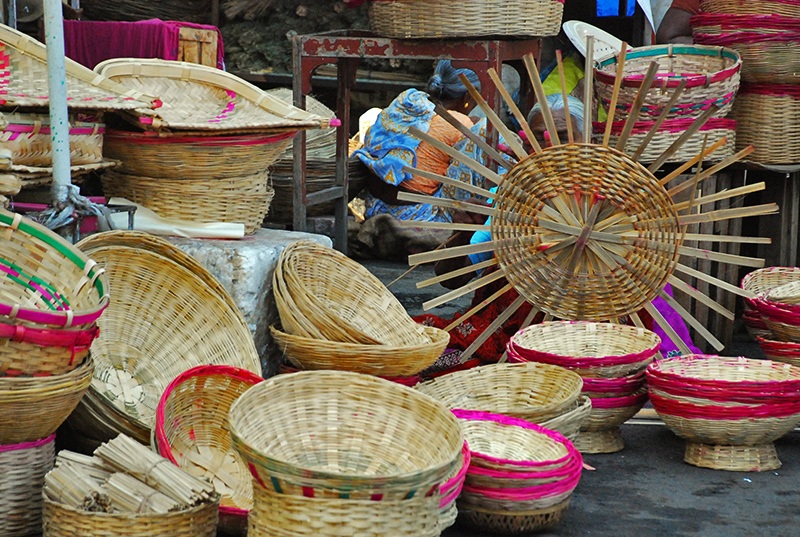 There’s a woman behind every beautiful basket too. impressive structure built by the British to deliberately change the then-prevalent system of openly selling vegetables on the streets by the Indians. The vegetables appeared fresh, and the Mandai provided me with some good photo opportunities. After quick visits to some of the other spots including Tulshi Baug Ram Mandir – a peaceful temple, we ended our 3 hour walk at Vishrambaug Wada, a fine mansion that used to be the luxurious residence of Peshwa Bajirao II. The organizers gave us each a decently sized Modak (a sweet dumpling) to mark the end of our tour, which all of us tired souls gulped down gratefully. Inside Mahatma Phule Mandai. He was enjoying a hot tea and didn’t quite appreciate my photographing him. I should say that the 3 hours I spent walking around old Pune was truly an exhilarating experience. When I moved to Pune, one of my friends had told me: “people either love Pune or hate it totally”. I thought I belonged to the latter group during my initial stay in Pune, but now I realize that I may be among the rare few who fall somewhere in the middle – as someone who hates Pune’s commercially developed areas but loves the rugged charm of old Pune. Great read dey, well written as always! Nicely written, Sampath. As always, very beautiful pictures. Amazing writing and pictures Sampath. Excellent!! Nicely putin thoughts… walking through Indian heritage is one of best way to relax as well learn about our brilliant past. Special thanks to u r Nolan. Lovely pics. Thanks Rekha…hope all’s well there? Thanks Raghu! Hope all’s well with you? Thanks a ton for the nice words Suresh. Appreciate it. Glad you liked the pics and article.